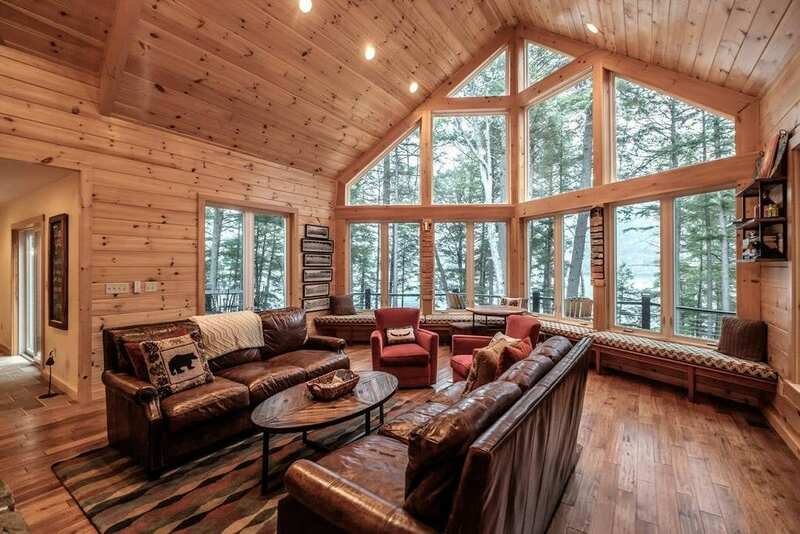 Looking for a fancy Airbnb in Maine? That’s a sensible call! “The Pine Tree State” is the perfect destination for adventure lovers across the spectrum. It’s known for its gorgeous landscapes with expansive forests, rolling mountains, and spectacular coastline. In fact, there is over 3,400 miles of coastline, giving visitors and locals alike countless things to see and do. Rich in maritime history, shopping galore and delicious seafood, this sea-filled state is guaranteed to amaze. From the bustling city of Portland to the unbelievable beauty of Acadia National Park, Maine is full of natural treasures waiting to be discovered. It’s no wonder that is also referred to as “Vacationland.” There is no shortage of historic lighthouses, seal watching, and unique Acadian culture. 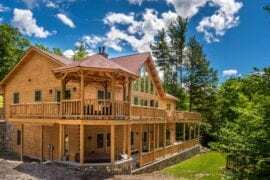 So whether you’re planning a trip to Southern Maine, or trekking all the way up to the Canadian border, we have a list of the most luxurious Maine Airbnbs available for your getaway. Both city-dwellers and deep woods cabin aficionados will appreciate these eight coastline rentals. 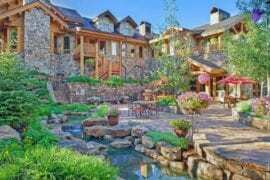 This luxurious lakefront cabin has seven bedrooms and six bathrooms, perfect for a group getaway! 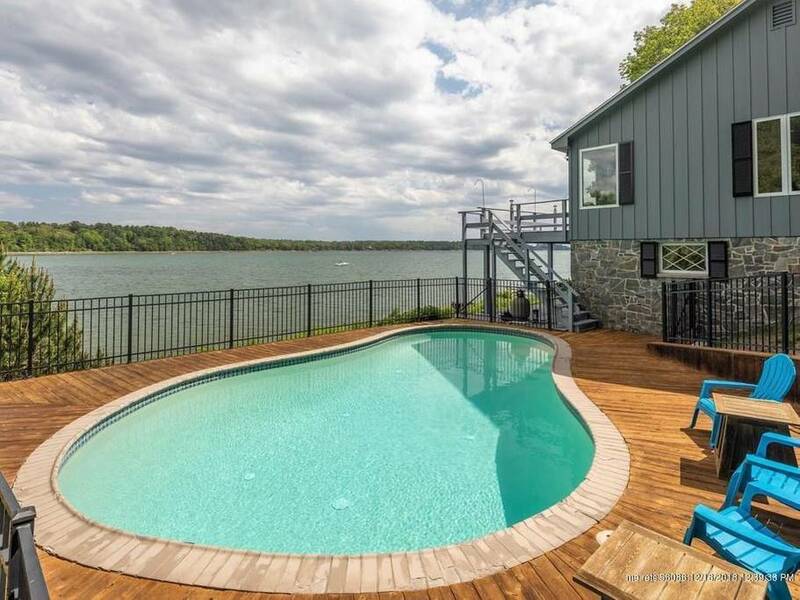 This rental is so gorgeous that country music star, Luke Bryan chose to celebrate his 40th birthday here. 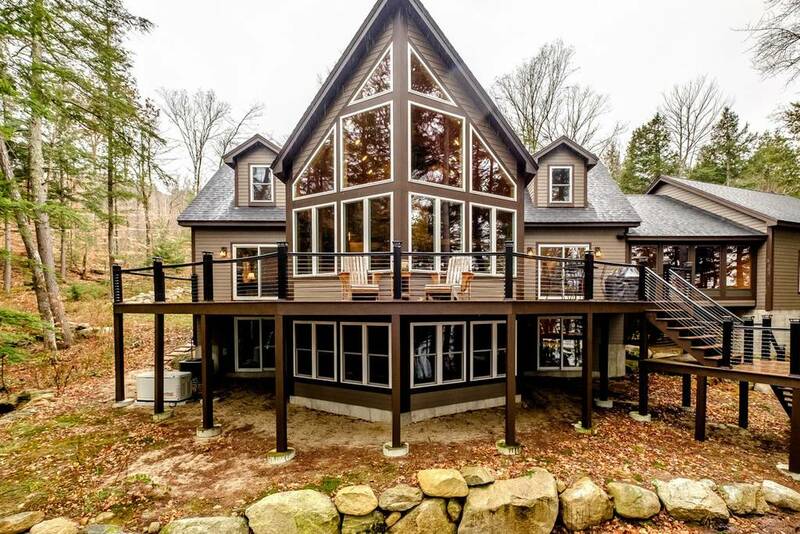 When you pull up to this home, you are instantly calmed by the serenity of the surrounding woods. Nearby are countless hiking trails, ATV trails, and hunting spots. 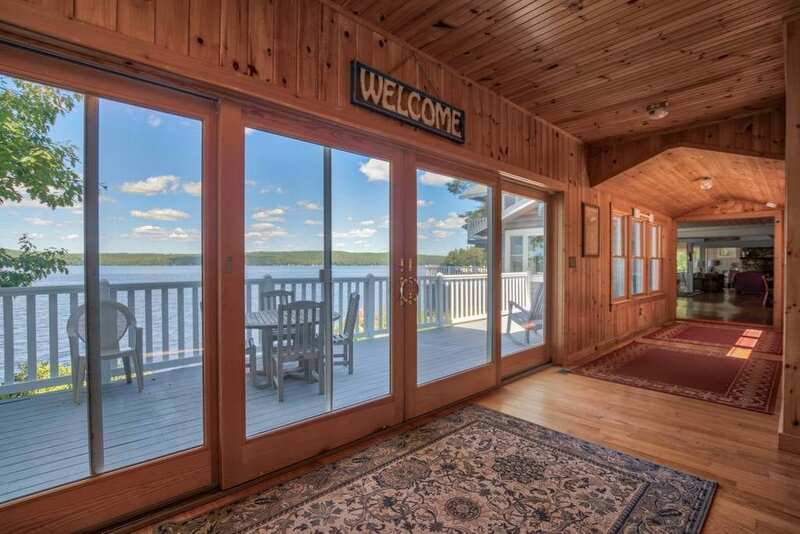 Nature and animals surround you as you overlook the spectacular lake with a private dock. 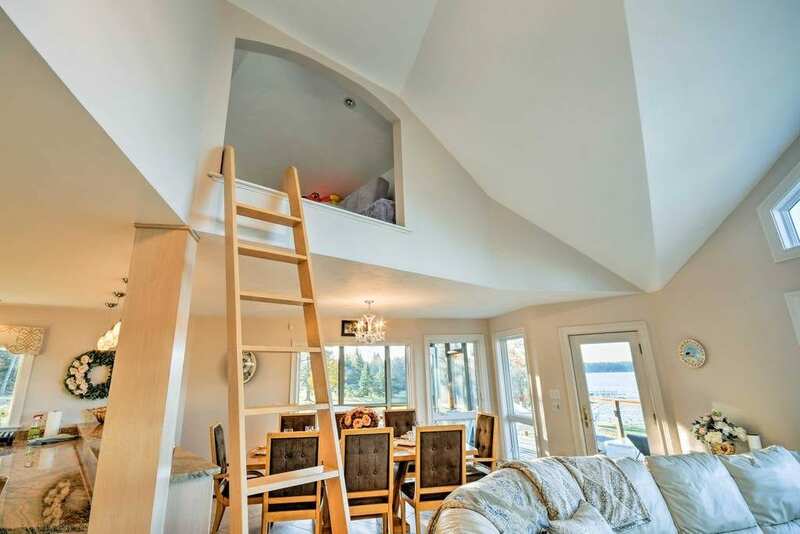 Included in this rental is an indoor sauna, a hot tub, home gym, theater room (complete with a popcorn machine!) and a game room. 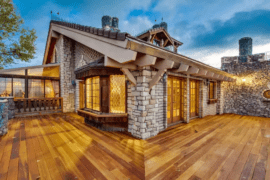 The amazing details throughout this home give it a unique, customized feel. Though the open floor plan gives you room to bring everyone together, there is still plenty of space for everyone to have private time as well. 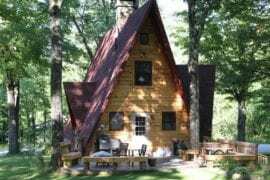 If you are looking for a private getaway – this Maine Airbnb is the perfect accommodation for you! 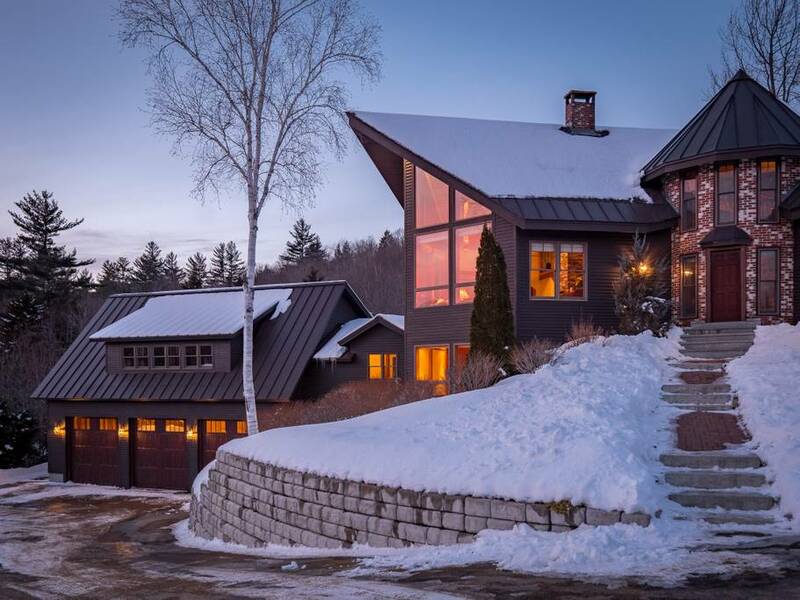 Located on five acres of private land, this home overlooks Sunday River and the Mahoosuc Mountain Range. In the colder months, head out back for some action-packed pond hockey! To combat the summer heat, you can take a swim in the pond that is surrounded by a manicured lawn. Just five minutes away is some of the best skiing/snowboarding on the East Coast. 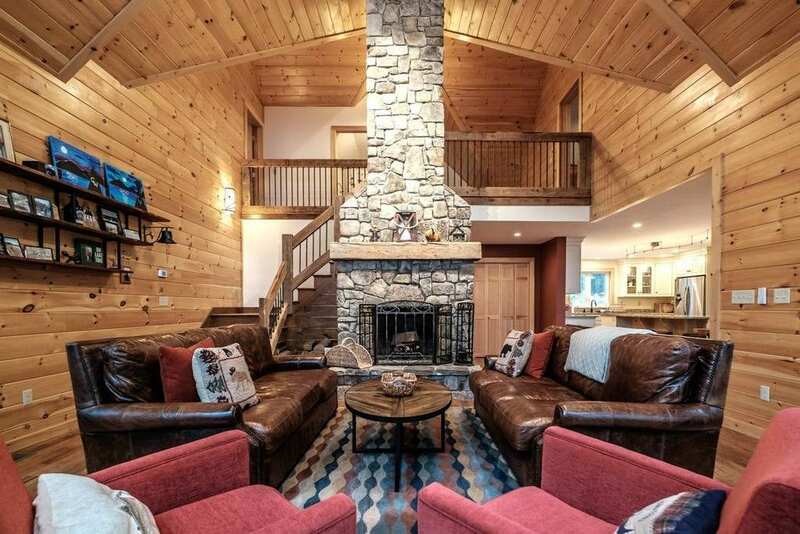 Compete with a custom bar, steam shower, and fitness room, this cabin is a marvelous recreational paradise. 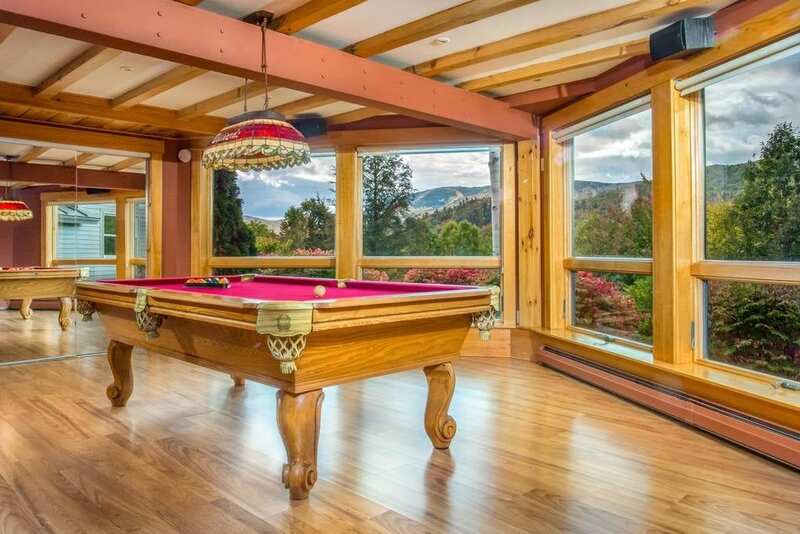 Come home after a long day of hitting the slopes and soak in the hot tub or relax by the fireplace and play a game of pool. 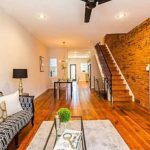 There is a brick turret extends from the basement to the second floor, gives this space a unique fairy-tale like twist. 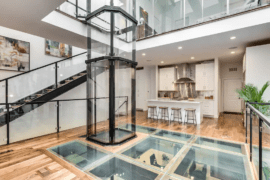 As you walk through the grand entrance, it brings you to the center of the turret that you can take downstairs to the bar or upstairs to the bunk room loft. An astonishing stay for guests of all interests. 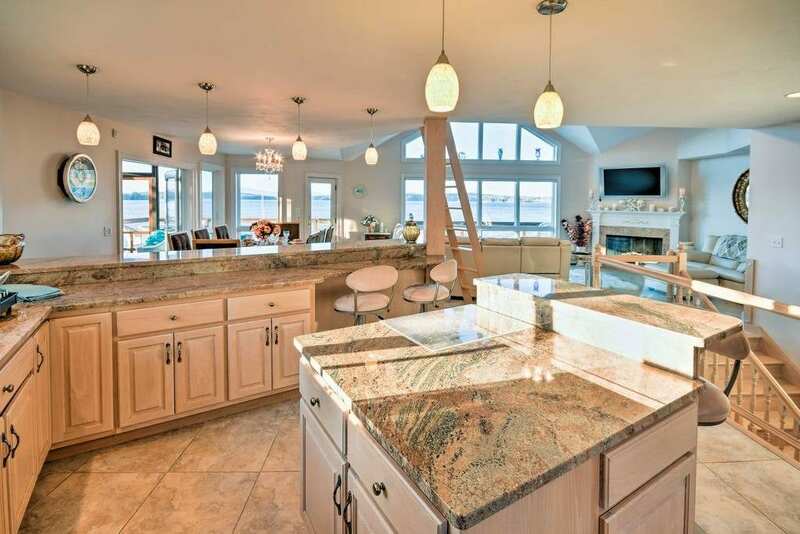 This four bedroom home offers unmatched luxury. 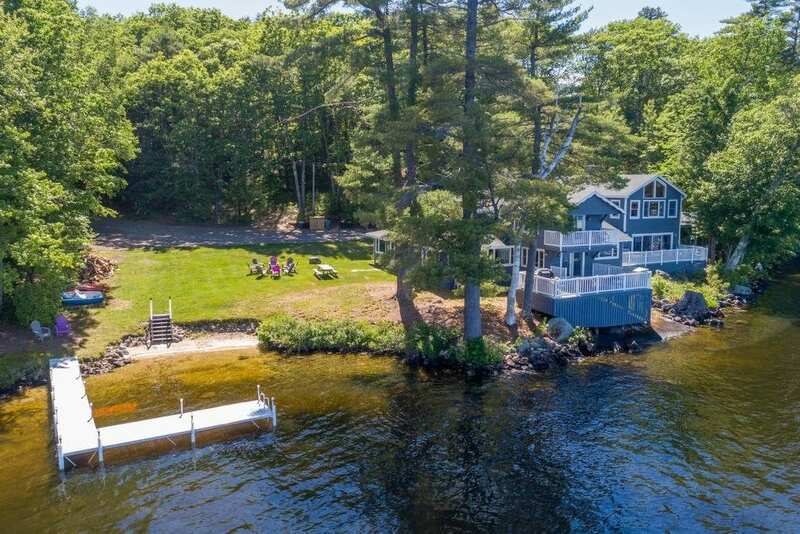 From fantastic amenities to private waterfront access, this rental provides the perfect adventure without the drive. 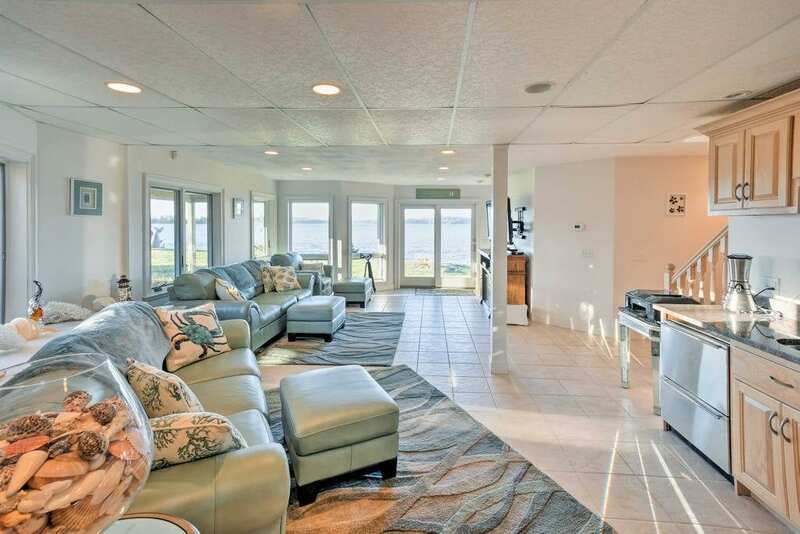 Enjoy the 3,000 square feet of living space as you engulf yourself in the beauty of coastal Maine. 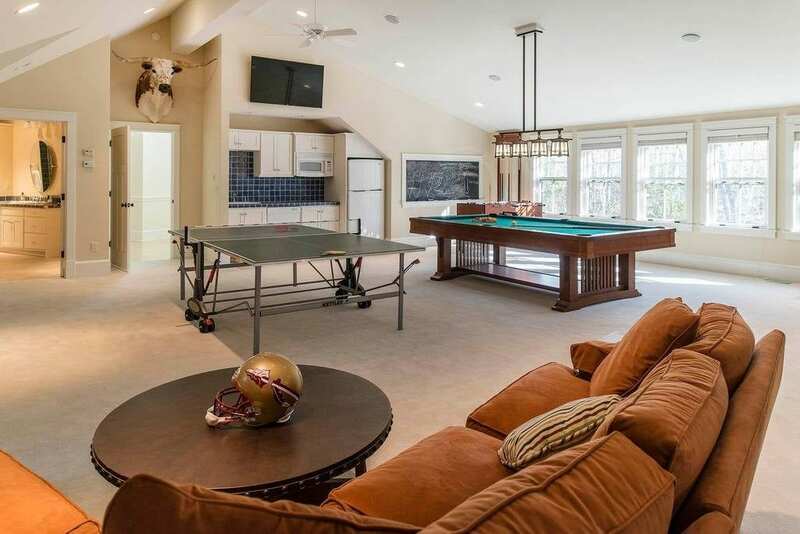 The kids can head up to the private playspace loft and adults can mix up drinks in the downstairs family room bar. In the colder months, send guests to warm up by the fireplace as you prepare dinner in the fully equipped kitchen with top of the line appliances. The screened in porch is perfect for evening stargazing and nature watching. For those feeling adventurous, feel free to enjoy the water, you’ll have access to three community kayaks and a two-person paddle boat! Take the day and explore the areas of Flanders Bay and Mt Desert Narrows. This home sits on the edge of the fantastic Androscoggin River. Housing six bedrooms and 5.5 bathrooms, there’s more than enough space to spread out and feel at home. There is a custom made table in the dining room with enough seats for the whole group. After dinner, play a game of giant Scrabble or watch a movie in one of the two media rooms. The unbelievable Game room comes with four PlayStations, each with their own screen! 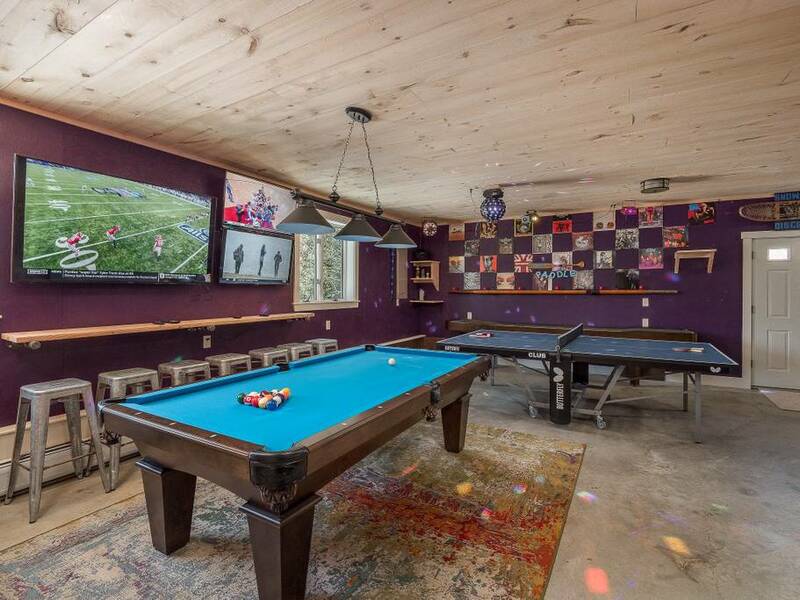 There’s also a pool table, Shuffleboard, ping-pong, Tiki Toss, and Foul Shot Basketball. 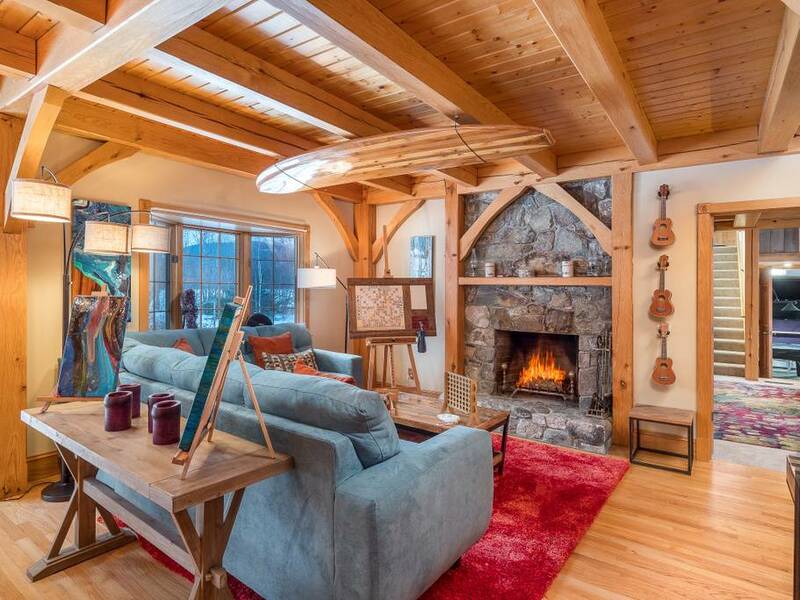 Around the corner from this stunning home is Sunday River. If the skiing conditions are less than ideal, stay home and round up the team for a game of ice hockey on the private rink. There’s even a private snowshoe trail with plenty of complementary snowshoes in the basement. 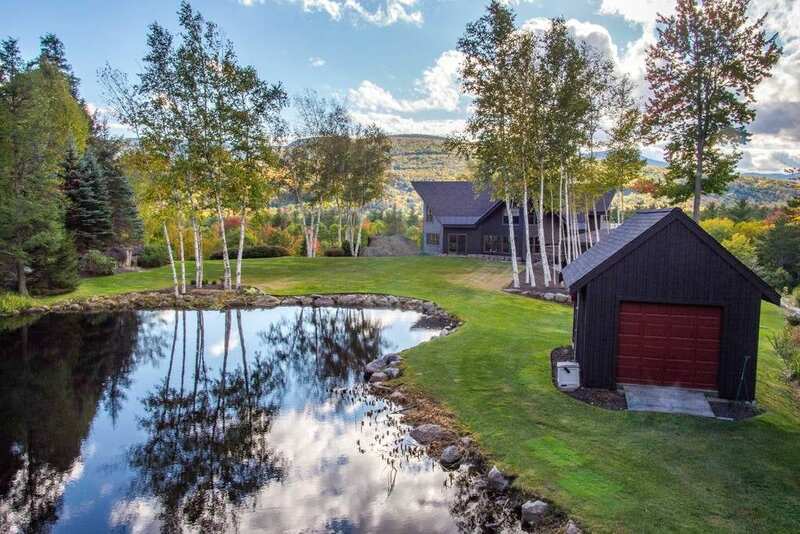 Sitting on ten acres of land, this enormous Maine Airbnb is ideal for unwinding after a long day of enjoyment. Nearby are the best spots for hiking, snowshoeing, cross country skiing, and kayaking. So no matter the season, you’re going to be in your outdoor glory! The living room looks as though it was taken right out of a designer home magazine with its enormous windows, peaked ceilings, and rustic wood design. The Great Room is a great spot to play cards by the fire or enjoy an evening cocktail. The downstairs media room has seating for ten along with a large television and wood burning stove. 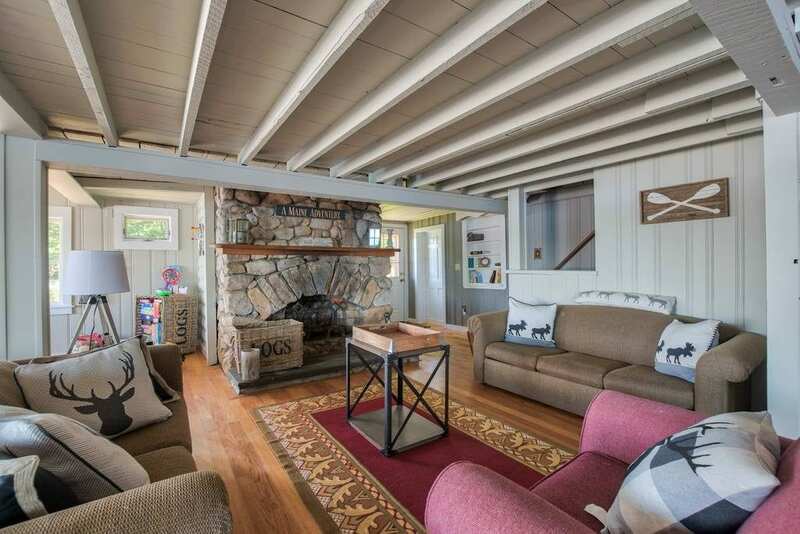 Ideal for a movie or competitive game of Shuffleboard! On warmer days, grab one of the property’s kayaks and become one with nature as you float under the energizing sunshine. 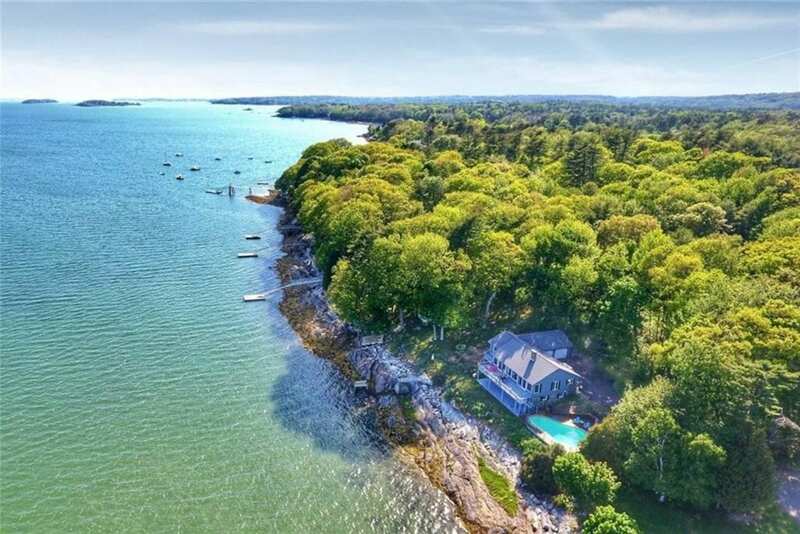 Perfect for those looking for coastal charm, this Maine Airbnb has been named one of the state’s most beautiful waterfront rentals. You will have access to the three-bedroom home along with a one bedroom guest house, swimming pool, and private dock. 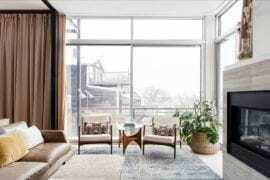 Walking into the house, you are immediately greeted with streams of natural light pouring in from the glass walls. The open floor plan invites a sense of unity between the dining and living spaces complete with contemporary furnishings and breathtaking views. 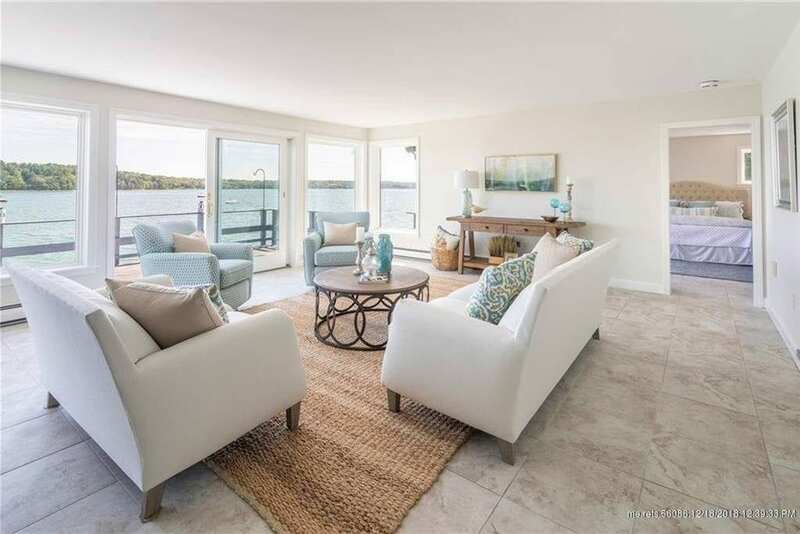 The deck offers a beautiful place to soak in the sunshine while overlooking Casco Bay. In the afternoons, grill up some local seafood and enjoy a glass of wine with friends. If you can tear yourself away from this gorgeousness, you are just a few minutes away from Downtown Yarmouth, Portland, and the Jetport. 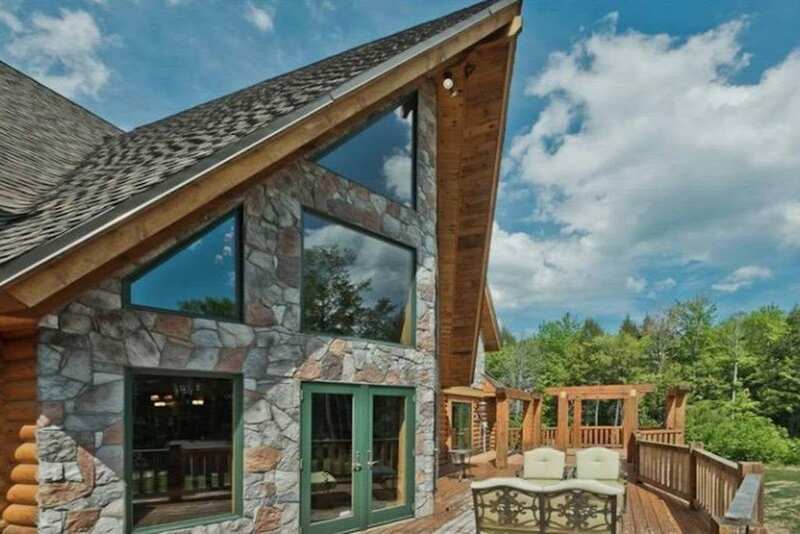 This large home is located on a private dirt road on gorgeous Long Lake. You will have access to the entire seven bedroom, 25 bed estate with a new dock, kitchen appliances, kayaks, and paddle boards. This unique Maine Airbnb blends old-school lodging with a modern twist. The original home was built in the early 1900’s but has been since renovated to give it an updated feel. You are just five steps away from Long Lake, and five minutes away from exciting Downtown Naples! 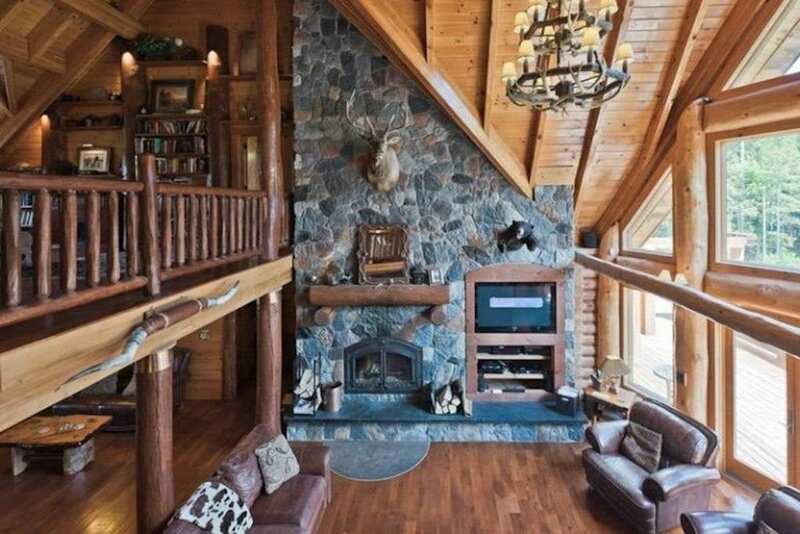 Inside there is cozy decor and a cabin-esq atmosphere with bunk beds, wood paneling, and seashore touches. There are multiple decks for your outdoor enjoyment, perfect for relaxing and listening to your favorite music. This rental is by far the most luxurious of all. 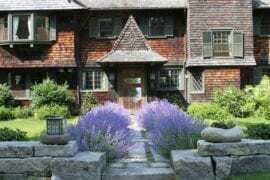 Located at 260 Ocean Avenue, this estate is close to the Bush Compound and housed on nearly 60 acres of private land. Giving you more than enough space to enjoy your beloved outdoor time. Arriving at the property, you pass the Guest Home with two bedrooms, a complete kitchen, dining and living space. Continue, and you will see the Tennis Cabana, tennis court, and basketball court. Finally, you will approach the magnificent home. Once you catch your breath, enter the Great Room boasting thirty-foot vaulted ceilings, a glass wall of ocean views, and a two-level terrace patio. Upstairs you will find the unbelievable game room. This mini theater has its own Monopoly pinball machine, a pool table, foosball table, shuffleboard, and a mini kitchen. If you’re feeling like enjoying the outdoor space, play a game of horseshoes behind the guesthouse or take a dip in the infinity pool or hot tub. There is even a brand new putting green and a fully equipped fitness center. 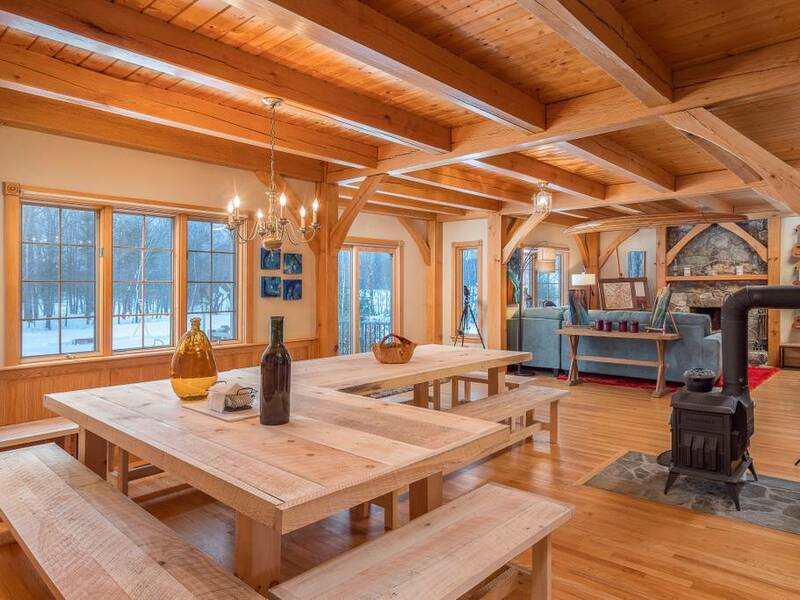 With amenities like this and unparalleled views, this Maine Airbnb will leave you feeling like royalty at all hours of the day. 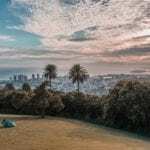 These are the 8 best Airbnb rentals in San Diego, California!